The Supremesoft Overall Equipment Effectiveness (OEE) Management System was developed on the Supremesoft Process Control System (SPCS) for a Tier 1 Automotive Supplier, to Ontario's number one OEM. The OEE Management System provides the plant management staff with the tools required to measure how well equipment or production lines are utilized in relation to their full potential. That is: Availability, Production and Quality. Through the resources of the SPCS the OEE Management System provides a real-time account of the status of the production environment at all levels: Plant, line, machine and device. It is no longer necessary to wait for the reported effects of production losses: Breakdowns, Setup/Adjustments, Small Stops/Idling, Speed Loss, Startup Rejects and Production Rejects. The OEE Management System provides the status of these potential losses and more importantly the overall status of Availability, Productivity and Quality, in real-time, at your request, from anywhere through on-line access through the internet. Challenges to the overall equipment effectiveness of the production environment can be recognized immediately and responded to promptly, reducing the cost risks associated with delayed data collection. Continuous improvement efforts can be measured and trended to analyze if they made the process run more effectively. 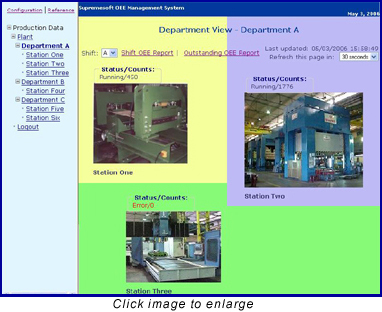 The OEE Management System provides a hierarchal view of the plant allowing drill down through plant, departments, lines, machines, and devices. These views can be refreshed at any selected interval and provide the relevant production status at that level. The OEE Management System provides a work-in-process production view including: Shift Schedule, Production Schedule, Start-up Checklist, and OEE status by Job and Shift including Downtime Reporting. The management view provided by the OEE Management System is built to answer the question of Overall Equipment Effectiveness. It provides the information required by production management for plant management and control. Use your definitions of OEE or meet your client definitions; OEE calculations are customizable to meet your requirements. 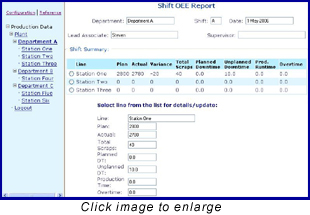 From the Management View OEE reports are available for all levels and are accessible by: Shift, Day, Week, Month and Year. The OEE Management System is configurable to represent your environment, your equipment and your standard job details, including downtime categories and codes. The SPCS is designed to integrate the production and enterprise environments with maximum reliability and flexibility. The SPCS foundation provides the middleware between the manufacturing systems and the operating needs of the plant: Performance Monitoring, Data Collection and Reporting, Communications to front and Back Office, Process and Device Control and is the Foundation for Application Development and Deployment.